Continuing the coverage on Hadoop component, we will go through the MapReduce component. 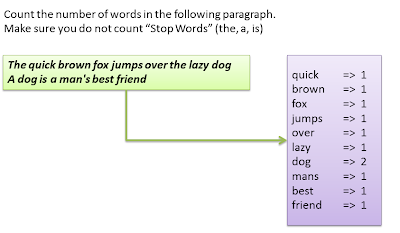 MapReduce is a concept that has been programming model of LISP. But before we jump into MapReduce, lets start with an example to understand how MapReduce works. 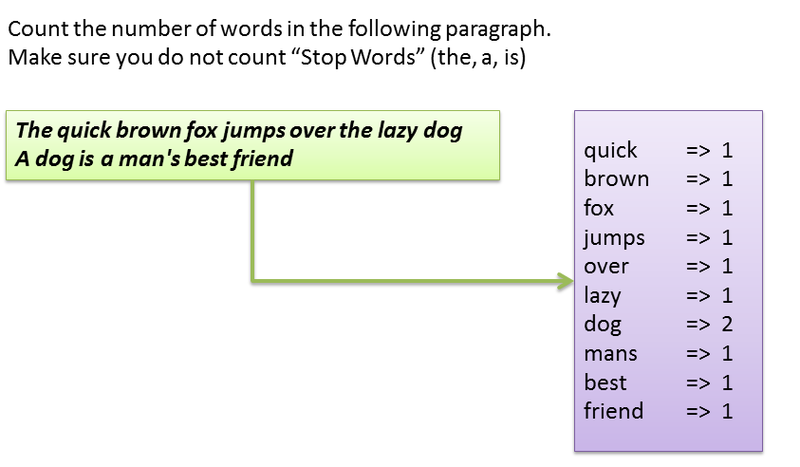 Given a couple of sentences, write a program that counts the number of words. Whenever a newbie wants to start learning the Hadoop, the number of elements in a Hadoop stack are mind bogling and at times difficult to comprehend. I am trying to de-crypt the whole stack and help explain the basic pieces in my own way. Before we start talking about the Hadoop Stack, let us take a step back and try to understand what led to the origins to the Hadoop. Problem – With the prolification of the internet, the amount of data stored growing up. Lets take an example of a search engine (like Google), that needs to index the large of amount of data that is being generated. The search engine crawls and indexes the data. The index data is stored and retrieval from a single storage device. As the data generated grows, the search index data will keep on increasing.